Dealing Members are hereby notified that the full suspension placed on trading in the shares of C & I Leasing Plc (C & I Leasing or the Company) was lifted today, 14 January 2019. The shares of the Company were placed on full suspension on 13 December 2018 to enable the Registrars update the register of members, sequel to the share capital reconstruction exercise embarked upon by the Company. 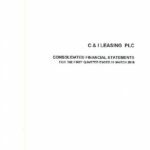 C & I Leasing has notified The Exchange that the reconstruction exercise has been completed and the shareholders’ register updated. Consequently the suspension placed on the Company’s shares was lifted today, Monday, 14 January 2019. Trading in the shares of the Company has resumed. The outstanding shares of C & I Leasing before the reconstruction exercise was 1,882,818,912 of 50 Kobo each. With the conclusion of this exercise, the total outstanding ordinary shares of C & I Leasing is 404,252,500 ordinary shares of 50 Kobo each. This is for your information and update. 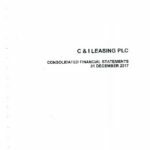 C & I Leasing Plc is a fleet management, outsourcing and marine services company in Nigeria with two subsidiaries in Ghana (Leaseafric) and the United Arab Emirates (EPIC International FZE). The company primary activity is offering extensions of structured operating and finance leases. Subsidiaries of C&I Leasing Plc include C&I Petrotech Marine Limited, a leading player in the offshore marine vessel sector with a fleet of over 20 vessels which includes terminal tugs, patrol vessels, fast support intervention vessels and a platform support vessel; C&I Outsourcing, offering Human Resource solutions for companies in Nigeria which includes human resource outsourcing, recruitment, HR consultancy and personnel evaluation; and SDS Training Services, offering custom-designed modules for training and education programmes, personnel training, driver recruitment and training and a consultancy service for strategic partners. C&I Leasing offers a fleet management service to improve fleet efficiency and productivity. C&I Leasing Plc has the sole franchisee for Hertz-Rent-A-Car in Nigeria and has run the Hertz operation for over 20 years. The Hertz subsidiary division manages over a 1 000 vehicles and a team of professional chauffeurs and offers an airport transfer service and daily rental service. C&I Leasing’s head office is in Lagos, Nigeria and has offices in Ghana and the United Arab Emirates. 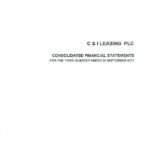 C & I Leasing Plc is a fleet management, outsourcing and marine services company in Nigeria with two subsidiaries in Ghana (Leaseafric) and the United Arab Emirates (EPIC International FZE)…. READ MORE.